Updated (long overdue) May 2013. This information has been provided by the Richardson LSAT Preparation Centre in Toronto, Canada. Those in Canada, wishing to attend law school in Canada, are required to take the LSAT. You may be interested in our Toronto LSAT preparation course dates. In other words the “LL.B.” designation is still used around the world. This does NOT mean that all LL.B. degrees are the same. The LL.B. used to be the degree of choice in the U.S. Until recently all Canadian common law schools offered the LL.B. degree. They have no transitioned to the J.D. What’s an LL.B.? What’s a J.D.? What’s an LL.M.? Why does it matter? Because of the different designations of law degrees, it is important that you understand what these designations mean. Canadian LL.B. = Bachelor Of Laws – although the degree takes three years in Canada, and is overwhelmingly taken after a bachelors degree, the LL.B. is an undergraduate degree. You will find the LL.B. degree designation in many countries that are or were part of the British Commonwealth. (Many American universities, in the early years, awarded the LL.B. degree. Click here to see see an LL.B. 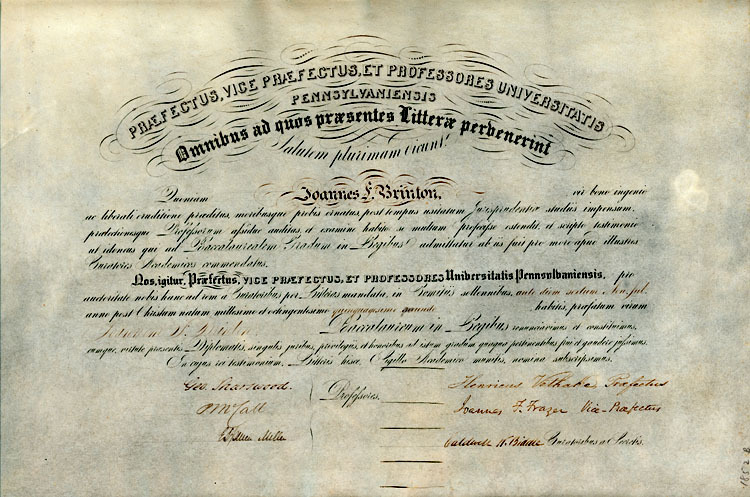 diploma awarded in 1852 by the University of Pennsylvania law school.) To add confusion to this, in the U.K. you can take either a two year LL.B. or a three year LL.B. J.D. = Juris Doctor – this is a graduate degree and was initially a U.S. law degree. In addition, Canadian (most Canadian law schools have transitioned from the LL.B. to the J.D.) and Australian law schools (Bond) offer a J.D. Make sure that you understand the difference between and ABA (American Bar Association) and non-ABA approved J.D.. The former will allow you to take the Bar exam in any U.S. state. Obviously an ABA Approved J.D. is the degree you earn from an ABA approved U.S. law school. Note that NOT all U.S. law schools are ABA approved. Differences between the Canadian LL.B. and the Canadian J.D. In Canada a J.D. is simply an LL.B. with a name change. There is no functional difference. This point is made in this interesting article about the Queen’s J.D. Almost all the common law schools in Canada have converted their LL.B. degree to a J.D. degree. Interestingly these are programs that allow one to achieve both a Canadian J.D. and an ABA approved J.D. from a U.S. law school. The content of these programs evolve. To understand the principle you want want to read this article I wrote on joint Canada U.S. law degrees. Canadian law schools have transitioned from the LL.B. to the J.D. This transition occurred over a period of about 15 years. What follows is a 2009 article that I wrote about the Canadian law schools conversion of Canadian LL.B. degrees to the J.D. For the most part the transition is now complete. This article (broken links and all) explains why the transition occurred. It is a bit of “Canadian law degree” history. Copyright © 2009, John Richardson. All Rights Reserved. All of the U.S. states and Canadian provinces (with the exception of Louisiana and Quebec) are based on the “common law” tradition. Quebec and Louisiana are based on the “civil” law tradition. This article will focus on the common law degrees. In the United States law schools award the J.D. (Juris Doctor). Canada is part of the British Commonwealth. Canadian law schools, until recently, have awarded the LL.B. (Bachelor of Laws). The LL.B. degree is a designation which means “Bachelor of Laws”. It is the basic law degree which has been offered by law schools in the British Commonwealth. It is by definition an undergraduate degree. In the U.K., it is common for students to study law as an undergraduate subject. Canada has 15 law schools which traditionally offered the LL.B. degree. After earning this degree, students would use this degree as the academic qualification to complete the licensing process to become a lawyer in a Canadian province. The J.D. provides the academic qualification to become admitted to the bar in the U.S. There is a difference between a J.D. that is “ABA approved” and a J.D. that is not “ABA” approved. An “ABA Approved” J.D. will allow one to take the bar exam in every U.S. state. A J.D. that is NOT “ABA Approved” will NOT allow one to take the bar exam in every state, but will normally allow one to take the bar exam in some U.S. states. – a U.S. J.D. degree which is ABA approved. The key point is that graduates of Canadian LL.B./J.D. programs earn a J.D. from a U.S. law school that is ABA approved. These degrees continue to be popular. Canadian law schools – converting the LL.B. to the J.D. 1. Again to be clear – a J.D. from a Canadian law school is NOT ABA approved and therefore will not allow one to take the bar exam in every U.S. state. 2. Graduates of Canadian LLB./J.D. programs will have earned an ABA approved J.D. from an American law school in addition to a Canadian law degree from a Canadian law school. Because they will have an ABA approved J.D. from an American law school, they will be able to take the bar exam in any and every U.S. state. Why are Canadian law schools converting the J.D.? Canadian Lawyer reports that Dalhousie is also considering the change from LL.B. to J.D. What Canadian law schools have converted to the J.D.? Note also the following Facebook group which makes it clear that the University of Calgary is also making the switch to the J.D. My prediction – it won’t be long until the LL.B. has become extinct in Canada. For more information don’t forget to join us for the 2009 annual Pre-Law Forum at Osgoode Hall Law School. Get your information direct from the law schools It’s free! Pre-Law Forum is organized and sponsored by the Richardson LSAT Prep Centre of Toronto, Canada. The 2009 Pre-Law Forum is graciously hosted by the Osgoode Hall Law School of York University in Toronto, Canada. Update: The 2013 Pre-Law Forum will be held on Sunday June 2, 2013 in Toronto. The LLB and JD degree are both the same. The only difference is that the ABA wanted to distinguish the degree beyond a bachelors degree which makes sense because of another three years of study to obtain the law degree to demonstrate that makes it really equalivalent to a masters degree in other discipline. There are way too many academic elitists who continue to maintain an outdated educational system to perpeutate the old boys system of tenure. Can i do llb through correspondence?if yes,what admission process,should i follow for doing L.L.B. Should i take a law course of LLB after BA or not???? Should i join a law course of LLB after BA or not???? honourable sir ! I want to get llb through distance learning? Is it possible? What is the procedure of taking admission in LL.B programe after passing I.sc . I am from india . Can you tell me a list of top LL.B colleges in india ? Is there any entrance exam to take admission in govt. Colleges of india ? The JD and the LLB is the same thing. While the JD is a professional degree that is typically pursued after receiving a Bachelor’s degree, the former does not necessarily require the student/applicant to underlay his educational profile with an undergraduate degree before entering a law school. However, most reputable schools expect the applicant to show competency via his/her undergraduate record(s). Otherwise, why would the LLM (a Master’s degree in Law) be regarded at a higher level in the field and pursued by JD graduates? Let’s face it, the branding of the LLB with the “doctor” term is an American attempt to elevate the degree from its undergraduate status to cloak jurists with the veils of academic elitism. Does Oxford University offer LL.B Law Programme? Hi I’m an undergraduate in business administration but I would like to switch to law and I don’t really know how to go about it…. I am planning to live in Toronto, Canada, soon. I am holding an LLB degree done by distance learning from England, UK. I actually live in the United States of America. Will it be possible to work with my LLB degree in the law field in Toronto? It is not ABA approved. How to convert my LLB to JD? Will it be necessary to do more studies to convert my LLB to JD? I am a lawyer / advocate from India with a 5 year B.A. LL.B (Honours) degree. In addition to that I had qualified the AIBE (All India Bar Examination) and was issued a Certificate of Practice from the Bar Council of India (BCI) and as of today possess 6 years of post-qualification experience primarily in civil and criminal litigation. I am now looking to move to Canada due to family and personal reasons and as such am planning to continue my law career in Canada. B) pass the mandatory 5 exams pertaining to Canadian Law, like Constitution, Criminal Law, etc. along with the Canadian Bar Exam. Is this the correct supposition of the requirement for me to practice law in Canada? Kindly advise. I like my 25 year old LL.B from Western, thank you very much. I’m a traditionalist and have zero desire to practice law outside Canada. Respected Sir, i am from india.i want to do juris doctor (J.D) FROM CANADA. Tell me about the process.